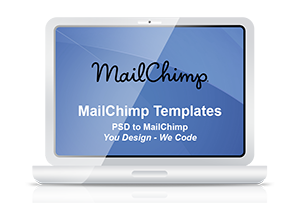 Clickandsend.biz are pleased to announce their new PSD to MailChimp Template Service. Simply supply your Artwork / Layered PSD Design and Clickandsend.biz will deliver your MailChimp Template files ready to go. This offer is for a desktop email. If you require a responsive email Clickandsend.biz can advise as to the best layouts for mobile devices so your MailChimp template delivers email that looks great on Desktop Computers and on Mobile devices such as iPhone. If you have no email designed Clickandsend.biz can help there by creating an email layout from your existing website design or other artwork supplied. Contact Clickandsend.biz anytime to discuss your PSD to MailChimp Template requirements. Clickandsend.biz recommend the following online services to send us large files as an alternative to sending large e-mail attachments. This entry was posted in Work Life and tagged email marketing, HTML Email, HTML Newsletters, MailChimp, MailChimp Coder, MailChimp Expert, MailChimp Templates, PSD to MailChimp Template, PSD2MailChimp, Responsive Email on August 27, 2014 by admin.